This is the solution to summer squash burnout – but definitely don’t wait until the end of squash season to try this. 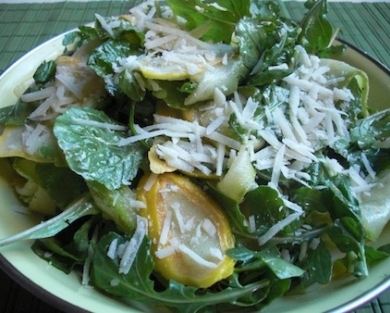 This recipe uses raw squash and arugula to create a bright, perky salad that is as delicious as it is beautiful. Choose a variety of squash colors for the prettiest look and bring it to your next pot luck. 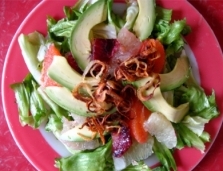 Prepare dressing by mixing oil, lemon juice, garlic, salt and pepper. Thinly shave summer squash lengthwise using the flat blade on a grater. Pour dressing over squash and stir gently. Allow to sit until ready to serve. Just before serving, mix in the arugula and cheese and adjust salt and pepper. Serve topped with home-made croutons or crushed nuts.